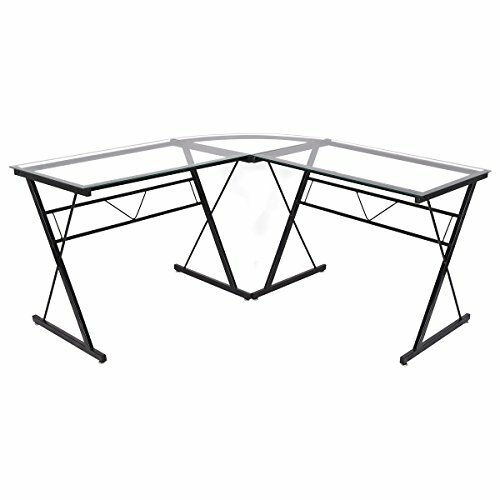 [Contemporary, Minimalist Style]3-piece modular desk with contemporary, minimalist style provides you a modern and stylish atmosphere in work place, it also can be separated into 2 desks. [A nice integration of top-level design and good material]Smooth work surface made of black tempered safety glass (polished and beveled). [Adjustable and Convenient]Includes independent CPU stand and sliding keyboard tray that can be mounted on either side. [Easy to install and reliable to support certain weight]Steel frame with black powder-coat finish provides optimal strength and stability; ships ready to build with step-by-step instructions. [Widely used for work space]Sleek, space-saving design fits any home or work office decor.